About SDSM | Swing Des Moines! Swing Des Moines is a group of swing dancers in central Iowa. Our focus is on education – teaching others how to dance, and teaching others about the history of swing dancing, jazz dance, and jazz music in America and the world. To achieve this purpose, we teach dance lessons, we give lectures and workshops discussing the history of swing, we give demonstrations of the various vintage swing dances, and we hold regular practice opportunities for our members and others to practice what they have learned while dancing socially (with others), which is essential to successfully learning to dance. Swing Des Moines has been promoting and teaching swing dance in central Iowa for over 8 years. It was founded by Randy and Sarah Reid in 1999. Swing Des Moines is a non-profit corporation with Federal 501(c)3 status. Swing Des Moines provides many services for the community and local businesses. 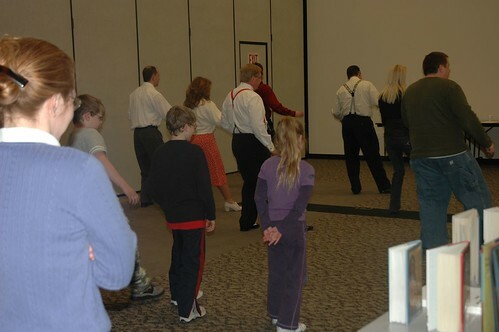 We are doing our part to enrich the lives of central Iowans by holding regular dances and teaching dance lessons. Our members are active in the community, supporting local bands and venues. We also serve the business community through participation in corporate events – we can get your employees dancing or your clients’ toes tapping with short lessons or demonstrations!